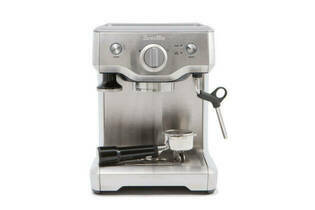 Snapshot: The Breville Duo-Temp Pro BES810BSS is a semi-automatic espresso machine with a cup warmer but no automatic turn-off. Can it make a good coffee? "This type of machine has a "but""
11 Jan 2018, Susan S.
Easy to make coffee at home. Tastes good & easy to use. I have now had two Breville machines with Thermoblock cutout. Not sure if it is our hard water or what, but the thermoblock seems to fail far too easily for my liking, making the machine useless as the cost of repair is more than it costs to buy new machine. I've gone back to café coffee - fortunately it's not too far to go. I figure it's cheaper than replacing the machine every couple of years. 21 Nov 2016, Jonathan C.
You can turn out great coffee consistently. Because it goes a lot slower than a commercial machine there's plenty of warning before you over-extract the coffee or burn the milk (also a downside). Sturdy construction of the group head and filter - haven't broken it yet and we've made shedloads of coffee with it. Slow - if you have a few drinks to make you will be there a while, mainly due to the time it takes to switch between extract and steam, but then it's not a dual-tank machine and is priced accordingly.